Half the thrill of game viewing in Amboseli or Abredare with elephants or buffaloes suddenly appearing out of the thick rainforest vegetation. Lake Nakuru hosts over 400 bird species, including 5 globally threatened species. Aside from abundant birdlife the Maasai Mara is a Big 5 National Reserve meaning it has Lion, Leopard, Buffalo, Elephant and Black Rhino which permanently reside here. Maasai Mara is a Big 5 National Reserve meaning it has Lion, Leopard, Buffalo, Elephant and Black Rhino which permanently reside here. Lake Nakuru hosts over 400 bird species, including 5 globally threatened species. The rich flora around Lake Naivasha attracts a variety of animals that include buffalo, antelope, giraffe, warthog and monkey, and you will almost certainly catch sight of hippos lazily watching proceedings from the cooling water. Abredare is a protected area with: lion, leopard, elephant, East African wild dog, giant forest hog and many more. 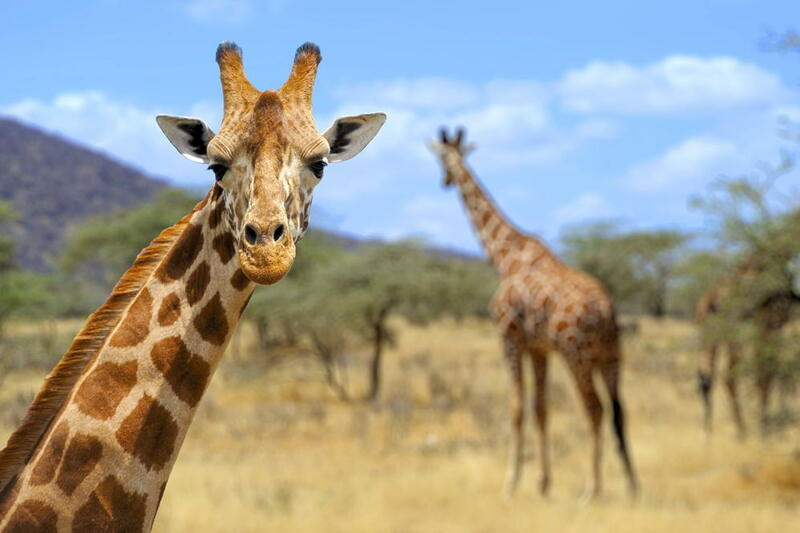 In the southern part of the park, you are guaranteed to see most of the Kenyan animals found in Samburu, namely: cheetahs, lions, leopards, impalas, buffalo, hippos, and dik-diks, as well as the native gerenuk, Grevy's zebra, reticulated giraffe and Beisa Oryx. Lake Nakuru hosts over 400 bird species, including 5 globally threatened species. Aside from abundant birdlife the Maasai Mara is a Big 5 National Reserve meaning it has Lion, Leopard, Buffalo, Elephant and Black Rhino which permanently reside here. Tsavo West National Park has a variety of wildlife, such as eastern black rhinoceros, hippopotamus, Cape buffalo, elephant, leopard and lion. There are also other smaller animals that can be spotted in the park, such as the bushbaby, hartebeest, lesser kudu and Masai giraffe. Masai Mara is the best place to see the "Big Five" animals (elephants, lions, leopards, rhinos and buffalo) together. The famous wildebeest migration also takes place at the Mara. Lake Naivasha is home to a variety of types of wildlife including over 400 different species of bird and a sizeable population of hippos. Lake Bogoria is referred to as "The healing place" and is just about 3 hours drive from Lake Nakuru. It is home to one of the largest populations of the lesser flamingoes and is geothermically active on the western shore, with geysers and hot springs. Amboseli National Park is a photographer's paradise thanks to the abundant wildlife such as lions, cheetahs, rhinos, and buffalo roaming under the shadows of majestic Mt. Kilimanjaro, Africa's tallest peak. With its large concentration of African elephants, Amboseli National Park is a fantastic choice for a truly breathtaking camping safari, in front of the world's finest photographic backdrop. Lake Naivasha is home to a variety of types of wildlife including over 400 different species of bird and a sizeable population of hippos. Lake Bogoria is referred to as "The healing place" and is just about 3 hours drive from Lake Nakuru. It is home to one of the largest populations of the lesser flamingoes and is geothermically active on the western shore, with geysers and hot springs. Get to visit the best reserves, parks and lakes around Kenya. 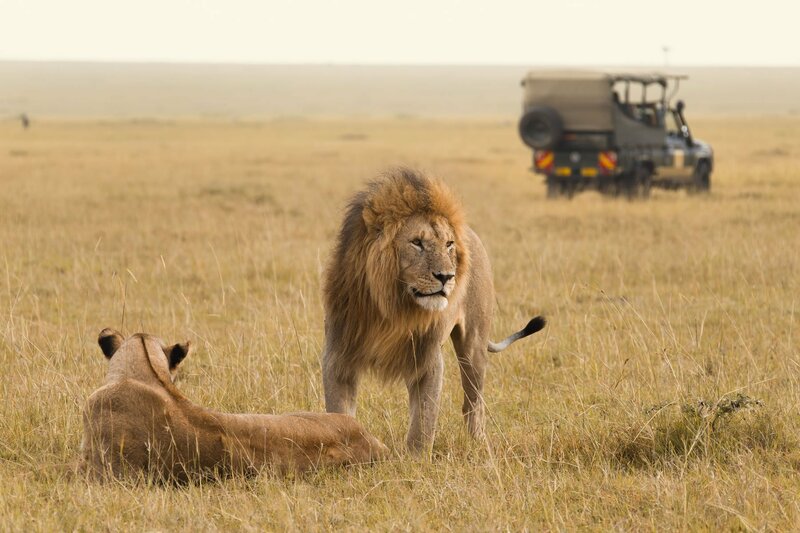 This Great Safari includes: Samburu, Lake Nakuru, Maasai Mara, Lake Naivasha, Amboseli National Park. Enjoy one of the best combinations of Lake Nakuru and Naivasha with its diverse wildlife and distinctive lakes and the world-renowned Masai Mara, Samburu, Aberdare and Amboseli. The best Kenyan Experience is this right here wildlife, birdlife and the beach life. 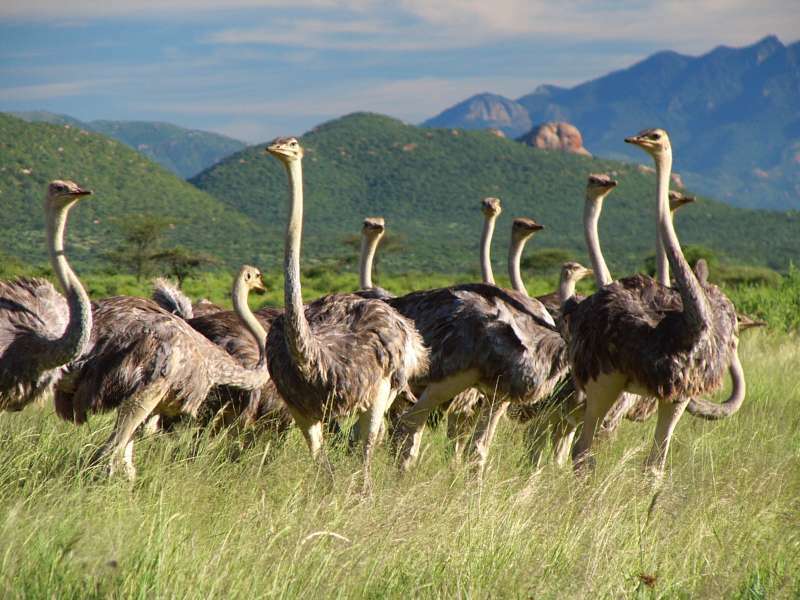 See the big 5; flamingoes on lakes, herds of elephants and many more. After all that, relax on the beach. Half the thrill of game viewing in Amboseli or Abredare with elephants or buffaloes suddenly appearing out of the thick rainforest vegetation. Tsavo West National Park has a variety of wildlife, such as eastern black rhinoceros, hippopotamus, Cape buffalo, elephant, leopard and lion. There are also other smaller animals that can be spotted in the park, such as the bushbaby, hartebeest, lesser kudu and Masai giraffe. Lake Nakuru and Naivasha host over 400 bird species, including 5 globally threatened species. The safari visits some of the best parks in Kenya. 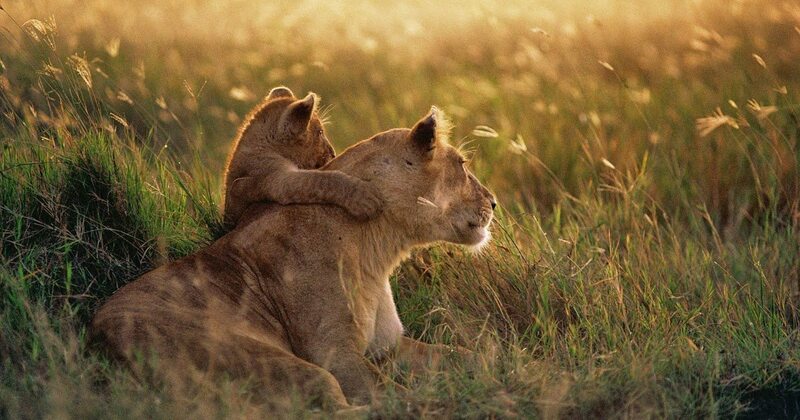 Kenya is the origin of the wildlife safari tours concept. 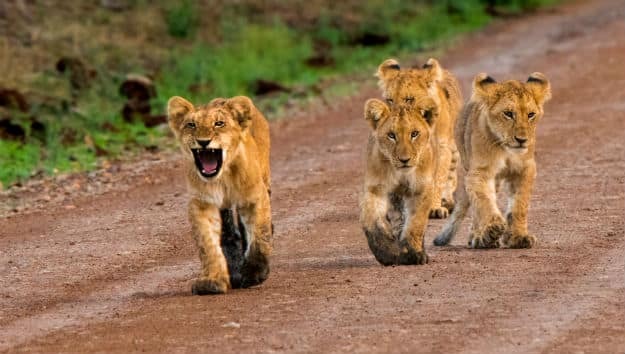 Safari, a Swahili word for journey describes wildlife, sightseeing and cultural tours through the national parks, game reserves and wildlife sanctuaries of East Africa. The diversity of game in Kenya is simply astounding. 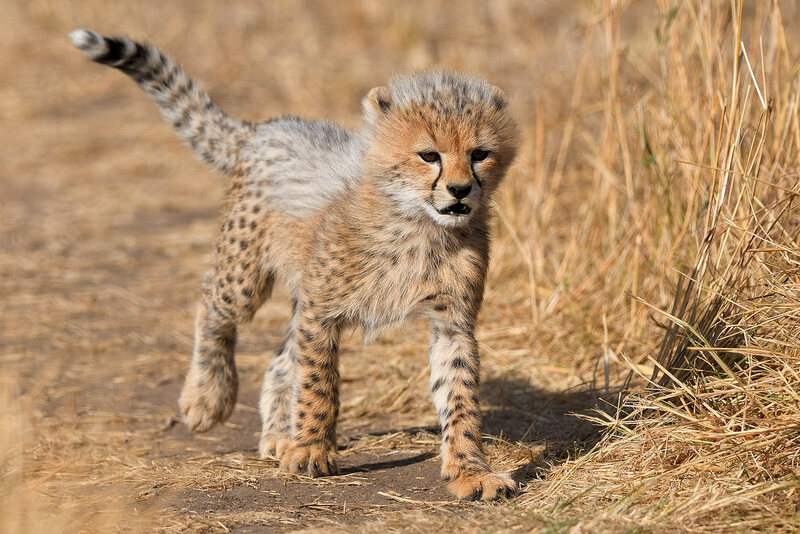 From the big five to the small five, Kenya’s game parks, reserves and other wildlife protection areas host some of the wildest game thus the reason why this is home for the safari. Dotted in their unique landscapes, geographical features, a vast array of game ensues.